“The proposal did not get through the second phase due to the ‘lack of impact and concretion’. We believe that this project needs to happen, and we will make it happen. There is a pressing need to reimagine cities and how they operate in order to respond to the ecological and social challenges of our time. Cities hold the potential for the reinvention of the current linear economy paradigm to a Circular Economy, and the Fab City Prototypes project aims to accelerate this paradigm change, allowing consumers to become actors of the design, prototyping and production processes at the local scale, while sharing knowledge globally. We build on the premise that individual change is essential to catalyse a collective transition towards more sustainable lifestyles. In this regard, citizens need to engage in self-transformation — which can be enabled through new product cultures and new cultures of design and production. The immediate outcome of the project will establish the necessary urban frameworks and lighthouses to guide policy makers to scale the results to metropolitan and bioregional levels. This will be fostered by partnerships with industry and local authorities. Linking micro-enterprise and citizen-led spaces with corporate and government sectors will create an ideal test ground to develop and implement approaches for an inclusive and impactful Circular Economy. The ambition is to pave the way for locally productive and globally connected cities, that foster social cohesion and well-being. STRATEGY > To develop a joint multiscalar strategy for the relocalisation of production between pilots based on the RIS3 process specified in the Smart Specialisation Strategy. Such a strategy has a focus on leveraging local capacities, capabilities, and resources in neighbourhoods, and to connect them with larger-scale ecosystems, including Smart Specialisation Regions and trans-European partners. Mobility, partner: Open Source Vehicle (third party). Identify: map local source materials, manufacturers, producers, artisans and other activities connected to circular economy and local production at neighbourhoods, and scalable to cities. The goal is to bridge with larger scale supply chains, in order to connect supply and demand for local production. Measure: metrics that measure the impact of Circular Economy products and services in the construction of the Fab City Prototypes vision. A common open standard for cities will be developed, based on previous work done by the consortium partners including UN-Habitat’s Urban Data, EU Open Data Portal, Smart Specialisation Platform, and Fab City Dashboard. Catalyse: to support the use of existing marketplaces and platforms that enable sharing practices, re-use of products and distributed manufacturing in each city using local supply chains and infrastructure. Share: a platform to share best practices and evidence among cities and consortium partners, concerning policies adopted, projects tested and citizen engagement strategies used. This platform will include instructional materials and resources to implement circular economy practices in design, innovation and digital fabrication processes. The Fab City Prototypes is a large scale demonstrator. It can be understood as a distributed city connected through online tools: the pilots in cities (Barcelona, Amsterdam, Paris, Berlin, Copenhagen, Milano, London, Zurich, Ioannina) will allow onsite experimentation with end-users and local ecosystems, while the sharing platforms will allow common metrics, knowledge and information exchange. For example: designs can travel across the demonstrator without having to be shipped physically — bits travel while atoms stay in cities. Pilots will provide opportunities to prototype, test and demonstrate the value generated from new relationships between different stakeholders in cities/regions, following the Smart Specialisation Strategy in each one of these, and existing guidelines such as the European Commission’s Blueprint for cities and regions as launch pads for digital transformation. A major challenge in transitioning toward and achieving a Circular Economy is its viability for small to medium sized enterprises (SMEs) and its implementation at local levels. This is an area where the greatest impact can be achieved. It is also the connection and interrelation of the small scale with global markets and global factors where ICT technologies (such as open source platforms to share and commercialise designs) will play a significant role in connecting all pilots. The project aligns with the ambition of Europe to become a smart, sustainable and inclusive economy. The key goals of the project are aligned with the primary directives of the Circular Economy Action Plan by contributing to the reduction of municipal waste and packaging by 2030. The project will prioritize the implementation of ecodesign principles, food waste as a resource for local materials that could be inserted in supply chains, and co-creation activities where users can become co-designers and co-producers in places like Fab Labs and community production spaces. We aim to scale best practice not only at the European level but also globally through the existing network of Fab Labs (1.100 labs) and maker-spaces which will be following the project, together with the existing Fab City Network (16 official members). The European Commission has promoted an ambitious program on Circular Economy by establishing “a common EU target for recycling 65% of municipal waste by 2030; a common EU target for recycling 75% of packaging waste by 2030; a binding target to reduce landfilling to maximum of 10% of municipal waste by 2030.” To be achieved, these goals require the involvement of civil society in creating new opportunities for materials to be used as resources for local production, and by establishing new supply chains between SMEs and industries at the city and regional levels. The Smart Specialisation Strategies can be used as a common approach between regions. The participating organisations actively promote equal representation of men and women in employment and decision-making, and removing institutional barriers to gender equality. The project will ensure women’s participation as active members in the different consortium entities. We support the mainstreaming of gender issues in circular economy business model research and policy, as a balanced gender composition improves the sustainability and quality of European business development. Gender consideration and equality will be carefully considered in our deliverables and overall communication strategies, as well as promoted and ensured through the composition of the Working Groups, and business models and policies to be developed. The current personnel making up the consortium (from all partners) results in near gender parity, with 35% female and 65% male staff at its first stage, aiming for a 50% and 50%, at least, for the final submission in phase two. Gender equality and gender balance will be a concern if there are any changes in personnel and activities within pilots and events. A key aim of the Fab City approach is to change how cities source and use resources materials by shifting from a ‘Products In Trash Out’ (PITO) model to a ‘Data In Data Out’ (DIDO) self-sufficiency model. This means that more production of energy, food and products takes place in the city in response to local needs, fostering innovation in local SMEs and startups. As a result, the city’s imports and exports mostly occur in the form of data, ranging from knowledge to design and code. 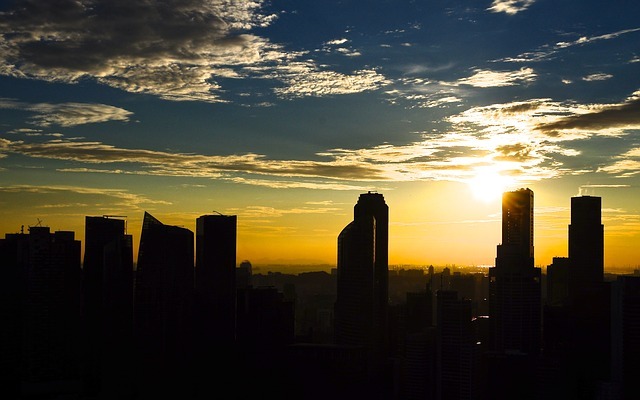 The application of this model can potentially reduce the energy that is consumed and the pollution that is generated when cities import goods and materials, which accounts for 70% of global carbon dioxide emissions. However, for this to be effective the city needs to be connected to a larger innovation ecosystem that produces the open source designs, code and knowledge — a digital “commons” — necessary to nurture the productive ecosystem at the local level. The benefits of such an approach are not only environmental, but cultural, social and economic. The Fab City model has the potential to foster economic prosperity by creating new types of jobs and professions related to the knowledge economy and the development and implementation of new approaches and technological solutions. This includes advanced manufacturing (digital fabrication, Industry 4.0), distributed energy production, new cryptocurrencies for value exchange, and food production (community supported agriculture) and circular economy (urban permaculture). Moreover, the approach aims to foster new collaborations between the government and citizens as well as a renewed education system based on learning-by-doing, finding solutions for local needs through digital fabrication technologies, and sharing them with others through the global network. Multi-scalar approach: From neighbourhoods to cities, to systemic change. The Fab City Prototypes project applies a new approach to the re-localisation of production in cities and the use of digital fabrication technologies at different scales: from domestic 3d printers that could use recyclable materials coming from food waste; to the neighbourhood community production spaces (Fab Labs) as co-creation platforms; the city-wide smart and flexible factories that manufacture products on demand based on open source designs; and the global supplies of highly standardized products and materials. Each one of these scales needs to be connected and articulated to act as a complementary ecosystem for local production. The city pilots will enable the articulation of these ecosystems in order to test new forms of value and business generation within the city consortiums, informed by Smart Specialisation Strategies in regions, which will be synchronised with the transversal tools and research supported by the consortium as a whole. The Fab City Prototypes project has a strong emphasis on business model innovation for circular economies, commons-based production and open source. 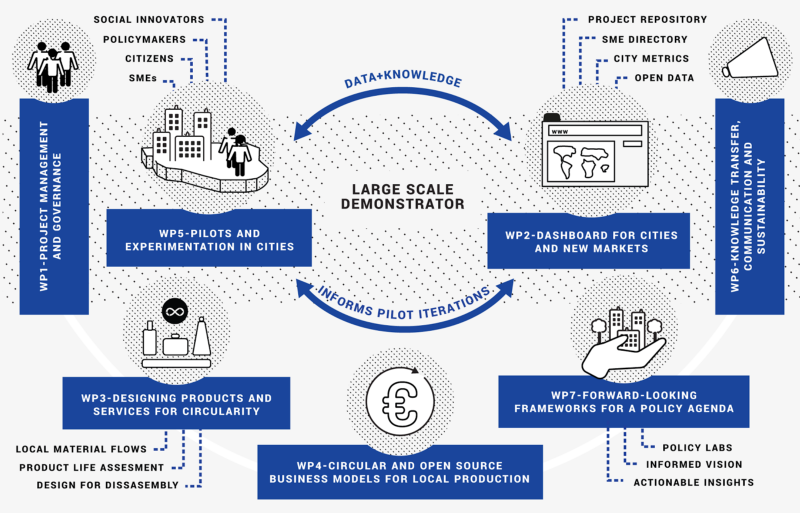 The project will explore, through practical experimentation, how businesses can leverage open source and circularity principles to develop sound business models that can boost economic growth, employment and resilience. The project will design and test a modular integrated toolkit based on the existing sustainable and commons-based business model innovation platforms and methods: Circular.academy, Pentagrowth, and Remodel. The project is structured in 7 interconnected work packages (WP), which comprise activities based on existing frameworks and experience from consortium members. These activities will focus on the role of end-users and SMEs in a new paradigm of distributed production. Consortium as a whole: The Fab City Prototypes will build a transeuropean demonstrator in cities that allows 25 different organisations — including SMEs, corporations, city governments (all participating cities will count on their local government as a consortium partner) and research centers — to develop sustainable business models for the local implementation of Circular Economy products and services emerging from SMEs and startups. Fab Lab Barcelona | IAAC: Will act as coordinator of the Fab City Prototypes project, and will conduct the main project management tasks in order to articulate the development of experiments in the pilot cities, and the development of online tools for distributed assessment and production. Fab Lab Barcelona will provide existing ongoing projects such as fablabs.io, Fab City Dashboard and Smart Citizen. City of Barcelona — Ajuntament de Barcelona: The City of Barcelona will support the local pilot activities, linking them with the Barcelona Digital City 2017–2020 plan, which is the city’s roadmap to drive technological sovereignty for citizens. Poblenou experimentation area will be linked to the Maker District and Ateneus de Fabricacion (the public network of Fab Labs). The city will facilitate the access to open data and public infrastructure to support the project activities. Waag Society (Research): Waag Society, home to Fab Lab Amsterdam, Textile Lab Amsterdam and Open Wetlab, is in charge of coordinating project pilots at large and coordinates the local pilots in Amsterdam in close collaboration with Metabolic and Pakhuis de Zwijger. Pilots in Amsterdam are concentrated on finding linkages between the city center and the surrounding countryside — and between the HORECA industry and makers inside the city — to find the opportunities for transforming consistent volumes of food waste into valuable inputs for decentralized agricultural and industrial processes in and around the city. Danish Design Center (Research and Development): Danish Design Centre will be responsible for planning and executing the Copenhagen pilot project, which aims to investigate and uncover the potential of local manufacturing as well as test the feasibility of the alleged new manufacturing revolution on industry-level as well as within new waves of smaller, yet scalable, digital manufacturing startups and SMEs. It does this by focusing on two objectives: Exploring the demand side, and exploring the supply side. Royal College of Art, London (Academic Research): The RCA will be responsible for providing design expertise (product, service and system) building on previously funded re-distributed manufacturing network and development of a design framework for viable circular and distributed production. In collaboration with Machines Room they will lead the executing of the pilot in London. Fab City Grand Paris (Association — Network): The role of the association Fab City Grand Paris is to coordinate the works on the Fab City Paris Prototype as well as to facilitate the collaboration between the fablab ecosystem, industries and the authorities. The Paris prototype will leverage the local expertise of the association’s member organisations, in areas like industrial design and digital manufacturing, architecture and urban planning, circular and collaborative economies, open source, urban agriculture, food innovation and social entrepreneurship. Metabolic (Research and Development): Metabolic is responsible for providing the circularity and sustainability expertise to the project, particularly knowledge of circular and resilient city development through the valorization of new streams of materials and information. In practical terms, Metabolic aims to bring the expertise on creating and running “De Ceuvel” (De Ceuvel). De Ceuvel is an award-winning, sustainable planned workplace for creative and social enterprises on a former shipyard adjacent to the Johan van Hasselt kanaal off the river IJ in Amsterdam North. Joint Research Centre (Research): The JRC contributions will stimulate and develop evidence-based and future-oriented policy strategies, using a wide range policy lab toolbox, and engaging an extended network of local, regional, national, EU and other international stakeholders through co-creation and foresight workshops. The Foresight, Behavioural Insights and Design for Policy Unit / EU Policy Lab (JRC.I.2) will be leading, with inputs from the Modelling, Indicators & Impact Evaluation Unit (JRC.I.1), the Territorial Development Unit (JRC.B.3), and the Industrial Leadership and Circular Economy Unit (JRC.B.5). P2P Foundation (Research and Development): The main role of the P2P Foundation will thus concern the documentation and sharing of practice-based knowledge produced by the pilots. Its research network along with the broader P2P community will leverage the metrics, assessment and design tools and the common infrastructure to produce, enrich and maintain a knowledge commons. i2Cat (Research and Development): Digital platform development such as Plataforma Industrial 4.0 and tools for data treatment developed in projects such as iSPACE. i2CAT will connect Fab City Prototypes project with the existing initiatives such as Smart Specialization Platform “Industry 4.0 & SMEs” with regional strategies such as RIS3CAT and with local industries that participate in the project Anella Industrial. OuiShare (Network): OuiShare will support the work on circular, open and collaborative business models, as well as methodologies for citizen participation and urban innovation. OuiShare will also support the dissemination of the project results throughout its vast network of entrepreneurs, communities, policymakers and companies (10K registered members, 40K newsletter subscribers, 100 local group managers) in Europe and beyond. UN-Habitat: UN-Habitat’s Urban Data Observatory will provide open APIs to the Fab City Dashboard to develop a common metrics for all the participating cities. UN-Habitat Urban Agenda is aligned with the Fab City vision, and it is now present in 90 countries around the world. Ideas for Change (SME): Ideas for Change will support the pilot enterprises in designing and implementing business models and engagement strategies by means of workshops, one to one sessions and mentorship. It will apply the Pentagrowth model and toolkit for open and accelerated growth, which has already been used by companies looking to transition to more contributive strategies while sustaining competitiveness. Pakhuis de Zwijger (Cultural organisation): Pakhuis de Zwijger will support the pilot projects in their visibility and connectivity through their Amsterdam based stage and different Dutch and European networks. Pakhuis de Zwijger will organize different events in which relevant stakeholders (a.o. government, businesses, science institutions, civil society and city makers) engage in a dialogue on a.o. (social) innovation, collaboration and financial structures. Machines Room (Fab Lab): Machines Room will act as the central node of activity within the Maker Mile, providing digital fabrication infrastructure and an associated education program. As part of the Fab CIty initiative, Machines Room will work with early stage redistributed manufacturing businesses in the local area to test business models and to assess where value lies for local employment, local supply chains, customer attitudes, materials and waste. City of Copenhagen — Copenhagen Solutions Lab: Copenhagen Solutions Lab, City of Copenhagen will function as the city strategic partner. CSL will offer expertise in different forms of public-private partnerships and connect the project to a substantial network of local partners. As city partner participation will ensure that the pilot and outcome also will be rooted in city policy. Finally, Copenhagen Solutions Lab will in the project function as access point to Fab Lab UNDERBROEN which offers relevant production facilities and a network of relevant SMV’s works with local, distributed production. Fab Lab Berlin by Makea Industries GmbH (Fab Lab): Fab Lab Berlin brings a state-of-the-art digital fabrication infrastructure and a related education program to the Berlin group. As part of the Fab City initiative, Fab Lab Berlin will identify, develop and test both demand- and supply-side potentials of business models based on local small batch design and production. However, the focus is put on the supply-side potentials and more precisely on three categories of potentials: novel materials, processes and applications. Fab Lab Berlin will further leverage the resources of its local, national and international network of research & education partners, makers & startups, industrial partners and policymakers for the sake of the initiative. Open State (Research and Development): Offering experience in setting up productive and diversified partner consortiums as well as designing a process for effective group decisions and output. “Transition design” means to form a holistic vision and story among all parts and partners, which are capable to tell one convincing message to the larger public. Documentation and open-sourcing of processes and products developed throughout the project. Winning over institutional and corporate city partners in Berlin. Politecnico di Milano (Academic Research): Polimi can embed into the project an evidence-based approach for policy formulation and evaluation, leveraging on the results of the development and application of a framework to evaluate pilots (results and impacts). In cooperation with the JRC EU Policy Lab, Polimi could support the application of a policy lab approach to the development of the Fab City concept, while applying a service design perspective. Finally, it could candidate the City of Milan as a possible site to host a pilot project. Ecovala (SME): Ecovala operates the Circular Academy, a training and coaching methodology aiming at facilitating the creation of circular business models. The methodology will support the transition of participating SMEs towards circular economy. Provenance (SME): Provenance will bring its knowledge of blockchain technology to create transparency in supply chains — including linking digital with physical, creating blockchain backed materials journeys and visualising materials flows and insights. They will assess, advise and provide a platform (user accounts, API etc) when needed, to develop and test blockchain technology for creating transparent local supply chains in the pilots of the project and in the creation of the Fab City Dashboard platform. Zurich University of the Arts (ZhdK) (Academic Research): Leverage links with local maker groups: Fablab Zürich: http://zurich.fablab.ch/; Dynamo (provided by the city of Zürich): http://www.dynamo.ch/; the Swiss Mechatronic Art Society: http://www.mechatronicart.ch/mechartlab/. Implementation of new Tools (Digital Fabrication) to the design process and in Co-Design (Next gen.CAD, OnShape.com etc) to the design process. ZHdK could host a city pilot in partnership with local SMEs and organisations. Fairphone (SME): Fairphone will provide their experience in the market with FP2, and will connect with the network of Fablabs as technology knowledge / manufacturing hubs, that can help support activities related to the lifetime extension of modular (easy to repair) devices. Fairphone is looking into opportunities for a more distributed repair experience in which the consumer is involved (similar to repair cafes). Zicla (SME): Zicla will contribute in turning waste generated by cities into new products for these cities as business opportunities, and to develop projects based on waste and to create innovative products that contribute to efficient, sustainable and, friendly business growth that pursues attending to cities’ needs. Zero Waste Europe (Network): Zero Waste Europe will support the dissemination of the best practices and results of the project through its network of more than 350 municipalities in Europe committed to achieve Zero Waste via its CSO members in 20 European countries. As an NGO specialised on waste prevention and management, Zero Waste Europe will support the work on circular economy business models, local policies and ecodesign, providing the consortium with an expertise developed for many years both on the ground and at the policy level. IKEA (Inter IKEA Systems): Inter IKEA Systems will contribute in the facilitation in pilots. IKEA is present in all the cities where pilots are located, and it is expected that material flows will be connected between these and community production spaces (Fab Labs, makerspaces). IKEA will contribute in the theme of furniture and households products. Read more about the ambition and the potential impact of the project here.